Essential fatty acids. Vitamins. Amino Acids. Flavonoids. Black cumin seed oil has them all. Together, these components make the oil a great moisturizer, anti-aging ingredient, and more, but you can think of it like you’re secret for strong, healthy skin. 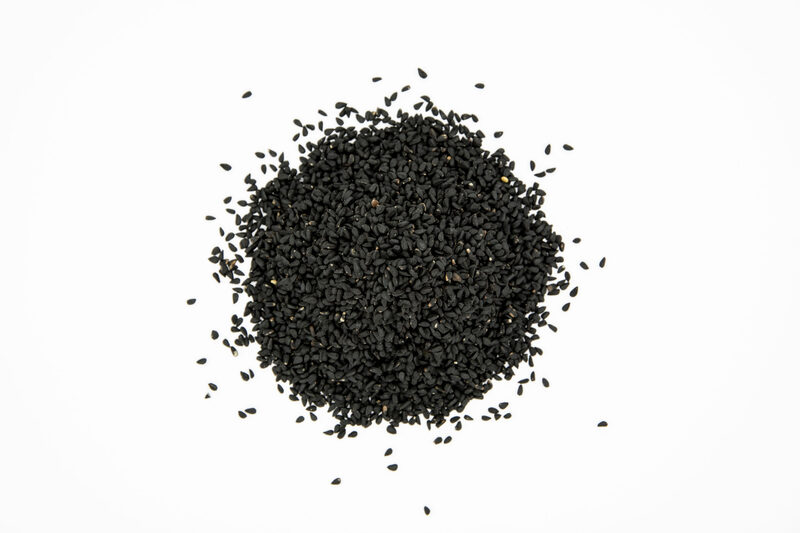 Black cumin seed reinforces skin’s health and vibrancy with anti-aging effects. Black cumin seeds come from a plant scientifically called Nigella sativa, and also referred to as fennel flower, nutmeg flower, and Roman coriander. An annual flowering plant, it’s native to south and southwest Asia, growing from about 8-12 inches tall. Flowers have 5-10 feathery petals and are usually pale blue and white. Balloon-like pods hold the seeds. These open in the shape of a five-pointed star, and over time, the seeds change from a pale color to black as they dry and mature. Traditionally, black cumin was used to stimulate energy and treat a variety of ailments, including liver and digestive complaints, jaundice, headaches, nasal congestion, and to remove intestinal parasites. 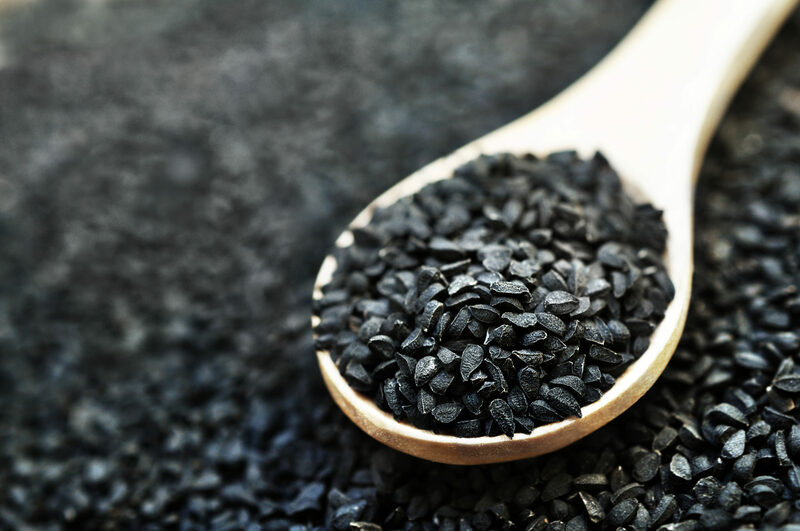 More recent research has found that black cumin seed extract may help to boost the immune system, tame allergies, and ease digestive complaints. Some research has also suggested they may help to lower blood sugar levels, potentially preventing or helping to control diabetes. The seeds are high in fiber, along with beta-carotene, calcium, iron, and potassium, and can be used to make a hot tea, to add to coffee, or to grind up and sprinkle on salads, casseroles, bread, and stir-fry dishes. Black cumin has many benefits when you apply the oil topically. The one that really sticks out as being different from many other plant ingredients is the oil’s powerful ability to restore the look and vibrancy of your skin. Black cumin provides vitamins A, B, and C, along with minerals like calcium, potassium, magnesium, and zinc, giving skin what it needs to be healthy. This oil has a reputation as helping to help with oily skin. If you’re struggling with too much oil and clogged pores, you need to try this oil. Like many natural oils, black cumin seed oil is rich in essential fatty acids that provide deep, lasting moisturization for skin. These fatty acids also help reduce the appearance of fine lines and wrinkles. Regular application of this oil will help to reduce the appearance of dark spots. Vitamin A and amino acids together with fatty acids help to encourage a youthful look. It’s difficult to describe the way black cumin seed works in a way that lives up to what it really does! Try it in our Anti-Aging Facial Oil, and let us know what you think. Do you cook with black cumin seeds? Have you used them for other health benefits? Please share your thoughts. I have made a tea by boiling/steeping the seeds in water. The taste is not bad at all. Hi, this seems like an old discussion but in case anyone else is looking I just found a great price for Organic pure cold pressed Black Cumin Seed oil, much cheaper then the other links I found on here too! I will be ordering it along with other oils for the first time so can’t comment on the quality yet but looks like a great site. Hope this works for both acne and constipation! That would be awesome!! You have wrongly said that prophet Muhammad said in the old testament. This was the book given to prophet Moses. Prophet Muhammad was given the final Scripture from God the Quran. The prophet did say that the black cumin cures all diseases except death. Our apologies! That part has been removed. After reading about all the benefits of Black Cumin Seed Oil I decided to try it. My mother who is 92 was scheduled for a colonic. I was giving her everything I knew to help her bowels to move, but to no avail. Since the oil is good for everything I gave her two spoons of it in one day, the next day her intestines started to work. I was absolutely amazed ! I was also a bit constipated, and had similar results. I continued to take the oil and apply it on my skin together with coconut oil. My skin started to improve right away. This oil was the best thing I found. I only wish it tasted better, but I ignore the taste, because the benefits are worth it It really feels good to see my skin looking so much better..I clearly am amazed that all these years I never heard about it. I live in Ontario, although I can find it here in the Health Food stores, even with the high US/Can exchange it’s still cheaper to buy it on line. I really started using this for my husband’s cancers (liver & lungs) but the taste is TERRIBLE!! He refuses to even try it again, so i’ve been taking it for a cpl of days and my skin has much less rosacea than it did before i started taking it. Now i know, two days is hardly cause for celebration, but if it continues, i will be over the moon happy! I’ve had rosacea for the last 20 years. I do have to put the oil in an empty gel cap so i don’t taste it. I would never be able to use it topically, because the smell rivals the taste–wickedly foul! That’s the LAST thing i would ever want to smell like, well, that and skunk! But taken internally, it’s pretty decent, as long as you can get past the turpentine/kerosene/paint thinner taste! Lol. Use a dropper. Go to the health food store and find one that is of the dosage that you want. When you have the oil in the dropper, lean your head back and squeeze it out, back towards your tonsils. If you need something to drink afterwards, room temperature honey, lemon, and water will do the trick. Peace unto you and yours. .
Peace be unto u ..
And spelt around the edges? And a wagon wheel is not driven over cumin. And cumin with a staff. This is the second time I’ve read that about black cumin oil, and it’s false information. I’m sure black cumin oil has many health benefits! But it should stand on those to prove its merit, not fake quotes. Hi Aysha — thanks for for the source information! I Have to question your reference to Muhammad being quoted in the Old Testament: Fact is, Muhammad was born about 1000 years after the Old Testament was written! I buy the amazing herbs brand off of eBay. Some sellers ship to Canada and some don’t but it shouldbe listed either way. and mix it in a jar with honey, then spread it on bread. I cannot provide an exact source, but I do believe there are a lot of vendors on the web that carry Black Cumin Seed Oil. I’d recommend Googling it or searching on Amazon. You can get it from Amazon or many online vendors. If you take it in powder form mix it with ordinary Cumin powder 50% each, Hence Black Cumin is Heat to Body. If you take in Oil form mix it with Honey. Take 1 Teaspoon once daily not more. Hi Radhi U can also try at Indian grocery stores . I bought one from subji mandi in Brampton. The name is herbal kalonji oil for 3 dollars 50 ml bottle. You will definitely find this in any pakistani/indian store or any muslim shops which sell halal products inshallah.